How do you view God? One’s view of God is critical to one’s image-bearing reflection of God. Holding and acting on a proper pan-Scriptural view of God one can reflect the nature and glory of God in one’s humanity. Holding and acting on a low or inadequate view of God will result in a reflection of a baser, beastly, and barbarous nature. There are plenty of examples of the latter. If a person says there is no god, then that downward blank stare is reflected back as a life devoid of the transcendent. This person’s life lacks meaning and purpose that God has provided (Col. 1:16). This person’s life is full of questions and no answers. This person’s life demands control of outcomes. This person may become suicidal. If a person says God is a female, then what is reflected back is a person’s belief that God’s self-revelation to us as Father, Son and Spirit is male privileged and not ‘inclusive’. Therefore, God must be ‘repackaged’ as humanized, feminized, and popularized for the masses. Those with this view of God have determined that God must not be separate and must be on par with us. These Gnostics ‘know’ what’s best. If a person says God is many, then that person reflects back a dilution of truth in the form of pluralism. Such a person is open to all kinds of error and deception to maintain their ‘inclusive’ view. If a person says God is distant and not available for comment, then that person reflects back an ‘On the Road’ life: avoiding pain, seeking pleasure, and surrounding themselves with like-minded friends. These few examples, of course, represent only a sample of the effects of a false image of God. A false, replaced or non-existent image of God will always result in a false, replaced and non-existent humanity. As a comprehensive study of history reveals, a people with dysfunctional views of God can result in barbaric societies. Focusing on these corrupt images means that one cannot reflect back the image of God. And, a false, replaced or non-existent image of God will always result in an egregious beastly rule over oneself and creation. Time will reveal the same truth. God let it be known from the start that Idolatry and its images, whether material or projected, is perilous to one’s image bearing reflection of God. The reason: we become like that we worship. Idolatry is worship of a lie. Living out worship of a lie results in a life that is a lie. Idolatry also dehumanizes, since it is a reflection of less than God likeness. Much less. Again, there are myriad examples of this in history and surrounding us today. Idolatry reduces God to His creation, either as a creature or to an element such as gold. For the idolater, reducing God to a creature or to an element means that God can now be controlled and molded into the image that works for him or her. But it is God who is the Image Grantor and Generator. To make an indelible impression on us, God took created elements – tables of stone – and wrote out, “Thou shalt not make unto thee any graven image“. Over and over again in Scripture we read that God made it very clear that all focus was to be on Him the Creator. To remove that focus was to bring down His wrath. God is a jealous God. Exodus tells the story of Israel’s God removing His people from the false Egyptian gods. And in the desert God lays down the law to tell His people how to be image bearers. As noted above, the Lord God is to be their focus and not idols. And throughout the history of Israel, the Lord reminds His people of the consequences when they change their focus. Later, Israel asked God for a king because their focus was set on other nations. Their first king, Saul, was an ego-centric control freak who turned mad. We become what we worship. I see examples of it every day at the fitness club. Often at the club, two Kim clones work their bodies to create a Kim-sized booty. To paraphrase a bumper sticker, “You can’t take your booty with you”. Since we are created in God’s image and likeness to have dominion over creation, it is easy for us to assume a self-important stance before God. We are prone to see ourselves as the center of life itself and the Son revolving around us. And, as shown over and over again in the history of mankind, some men and women will convert their ego-centrism into a form of self-divination. These will expect and perhaps demand that others recognize them and even worship them as transcendent or divine. I am talking about those who see themselves as exalted based on power or status or one’s physical appearance. Examples would include Pharaohs, Assyrian Kings, Roman emperors, rulers of nations, heads of state, celebrities, politicians, and superheroes (you worship them with your time and dollars). King Nebuchadnezzar made an image of gold, sixty cubits high and six cubits wide, and set it up on the plain of Dura in the province of Babylon. 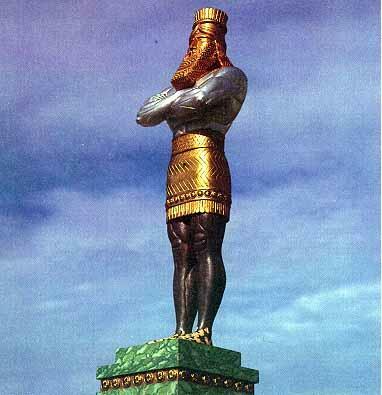 …the herald loudly proclaimed, “Nations and peoples of every language, this is what you are commanded to do: As soon as you hear the sound of the horn, flute, zither, lyre, harp, pipe and all kinds of music, you must fall down and worship the image of gold that King Nebuchadnezzar has set up. Whoever does not fall down and worship will immediately be thrown into a blazing furnace.” …you must fall down and worship the image of gold that King Nebuchadnezzar has set up. The three exiles were not doubting God’s existence. Just the opposite. They were adding fuel to the fire. They made sure that there would be no shadow of doubt in their reflection of the existence of the One True God. Their words turned up the heat. And once their God-reflecting humanity was miraculously delivered unsinged from the beastly hot furnace, the King was left without excuse and with plenty to think about. He could easily imagine his giant golden image melting like wax before the separate and not equal God. And Hezekiah prayed to the Lord: “Lord, the God of Israel, enthroned between the cherubim, you alone are God over all the kingdoms of the earth. You have made heaven and earth. Give ear, Lord, and hear; open your eyes, Lord, and see; listen to the words Sennacherib has sent to ridicule the living God.